Introducing our new sister brand "e" by ecrandal. These cookie cutters are offered in some of the same great designs of ecrandal at about half the cost. Each cutter is still inspected carefully to ensure the ecrandal quality that you are used to. The main two differences are the lack of hem and a lower depth. These changes allow us to be able to offer you our cutter designs at a much lower cost. 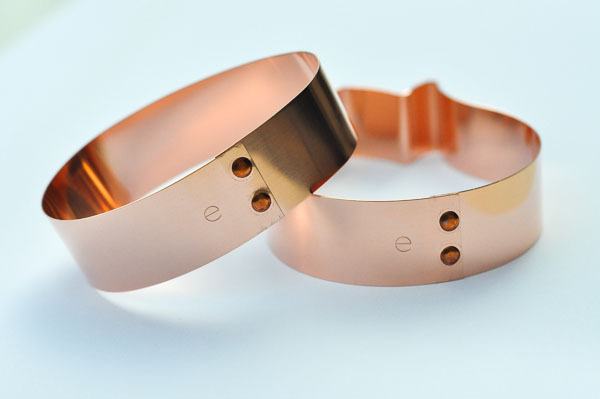 They are still made using the same high-quality copper so you can count on the materials being the best. While we are very proud of this line, we do want you to realize that they are different from our original ecrandal cutters. Our "e" brand will lack the rolled hem at the top that our ecrandal brand is known for; which does add stability, beauty, as well as ease of cutting. Care should be taken with our "e" brand as the no hem reversible design will make both sides sharp, so please cut with care. Also, "e" cutters are not as tall as our original ecrandal cutters, but still plenty tall enough to cut through dough, fondant, toast, pancakes, clay, etc. just as well. The "e" brand cutters are still fastened using rivets but lacks the offset joint. Every cutter lays flat to cut smoothly through your dough. These new cutters are a much superior alternative to the increasingly popular plastic 3D cutters out there. Being made with pure copper they are built to last a lifetime at a cost similar to the lesser quality plastic or tin which will deteriorate, rust, or misshape over time. We hope this addition to the ecrandal family is a welcome one! Please feel free to contact us with any questions or suggestions for shapes you would like to see offered in our "e" brand! For our current available shapes, click here!